Half of adults normally carry less than £5 in their purses and wallets amid the rise of plastic ‘tap and pay’ cards. The move comes as banks and stores try to push the population to drop folding cash and coins. Using contactless cards, which can be used for everything from paying a bus fare to buying a coffee, means people no longer to fumble around for money. This same contactless payment technology has now been built into smartphones and watches, like the Apple Watch, further speeding the demise of cash. A survey by card giant, Mastercard, found that 47per cent of people typically have less than a fiver on them. The study found 43per cent of people are carrying less money than they were two years ago, simply because they don’t need it for everyday purchases. That’s right, losers, if you’re still using cash these days you’re living in the past. The President of Mastercard UK and Ireland, Mark Barnett, said: ‘We’re in the midst of a period of unprecedented change for payments. ‘Cash usage is being buffeted by the dual forces of increased online expenditure and consumers embracing the convenience, speed and security of card and digital payments. 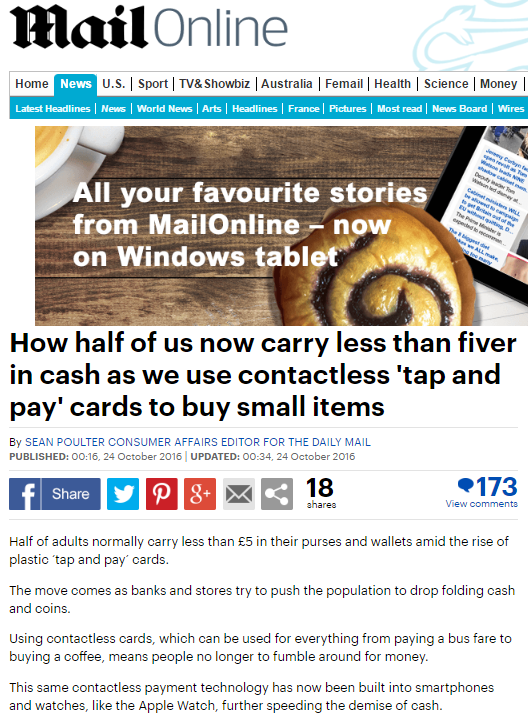 Speaking of living in the past, I imagine the survey also found that those who used cash most frequently also preferred their newspapers to be filled with articles based on reality with a number of verifiable sources, whereas those who carried less than £5 in cash were more comfortable with an online news behemoth which reprinted 90% of the press releases it received in an endless quest for maximum click rate. Ah, the acrid scent of the future! This entry was posted in Mastercard on November 3, 2016 by Michael Marshall.